The Kpop Jungle: We're Invited to Toheart's Slumber Party in "Delicious"
We're Invited to Toheart's Slumber Party in "Delicious"
When SM and Woolim broke the news of their new partnership, I didn't know if I was going to laugh or cry. I mean, both of my bias groups (SHINee and Infinite) would come together and that could of course mean a lot of potential collaborations which I was excited about but at the same time I felt terrified. Mostly for Infinite though, because they've come such a long way, coming from a small indie label and having to work their way up with good music and dance routines without the help of a big company backing them. I admire them for that and I was afraid they were going to loose their originality and modesty, and as much as I love SM groups I have a lot of issues with the actual company, so I could not help but to think what might happen to the boys. So far it seems like things are going well though, and now we even have Toheart to further prove this. Woohyun and Key are best friends and I can definitely see why they get along, so I was thrilled to see what their project might sound and look like. This video is surprisingly long, having both a hefty intro and outro. It opens with the actual intro of the mini album playing in the background as the two friends are sitting together and looking through boxes containing childhood items such as toys and notebooks. We are introduced to the plot of the video quite early, as each of the boys have their own "notebook" in which we see them as kids and they have a combined one showing them as teenagers (or their current selves) both falling for the same girl. The way in which this is done is creative and original, and I already have high hopes for the rest of the video. Then the actual song starts and I have a hard time even getting through the first 30 seconds. I don't think I've heard such cringeworthy English in a really long time. I'm pretty immune to bad English after so much exposure to it, but this had my ears almost physically hurting. No Key, love is not "nutritious" or "delicious" as you say. I don't want to hear that, I really don't. I doesn't help that his rapping is not that great either. Anyway, once that part is over, I can finally start enjoying the video. Well, that line repeats itself throughout the entire song but I guess I'll have to bear it. Key and Woohyun are fighting over a girl, a girl whom they both want but never actually appears in the video. However, they are seen peeking at her through the window with binoculars. If that's not creepy then I don't know what is. It seems like they live together, and I'm curious about their relationship but more so their ages. The entire room looks like it could be for a 6 year old, with lots of rocket and space related items (such as their sheets) and also the fact that their sleeping in bunk beds. They are throwing pillows at each other, sort of fighting childishly as they think about the girl they are crushing on. The cutest scene in the video is the one that takes place in the bathroom. It's the morning after, and the boys get ready for their date. They brush their teeth, shave their non-existent facial hair and bicker like only bff's would. Later at the diner (fittingly called "Milky Way") they argue back and forth as the girl supposedly has made a date with both of them? Anyway, nothing after that really happens and the rest are just dancing cuts. The ending though, that was by far the best part of the video. The outtakes from the bathroom scene allow us to get a glimpse of just Woohyun and Key being Woohyun and Key, which is what most fans wanted anyway. I have really nothing negative to say about this video, which rarely happens. It's apparent that SM had very little to do with this, and even if they are the distributor and uploader of the video, everything else just screams Woolim. The sets are great, the choreography is great, the styling is great (apart from Key's eyebrows) and I adore the vibrant colors and lights. This is not something SHINee would do, but it's more down Infintie's alley in terms of sheer video quality. I also liked the dance scenes in the big white room, because of the color matching, once again. The back-up dancers are dressed in white so they are hardly visible but just enough to still have an impact, and the boys' suits match the big text on the wall behind. It's a visual treat, for sure. In fact, the entire video is. The lyrics of the song perfectly suit the plot in the video, two friends wanting the same girl. 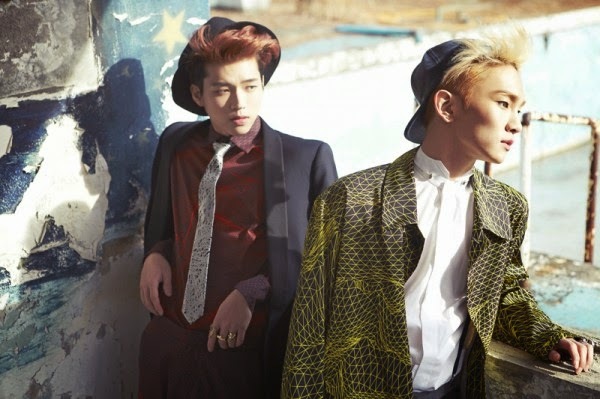 As Key and Woohyun take turns in singing, they also tell a story from their specific point of view. It's a nice touch and further enhances the concept. However, the most satisfying this about this video is just seeing these two best friends together. Their chemistry is off the charts and while I'm curious as to why there's no visible love interest I can also understand why. Fans like Key and Woohyun, and they like them together. People want to see their friendship (me included) and throwing a girl in there would kind of ruin that a bit. I personally would have wanted for the love interest to show up at the diner and than just ditch them both, because that could have been hilarious. This video, in conclusion, is a lot better than anything SM has put out in what feels like years. I suppose we have to thank Woolim for that, so thank you. Is this video really anything other than pure fanservice? No, I don't think so, but it's the best fanservice there is. Everything just works and they both look and sound great. Even though the song is a bit lukewarm, the video more than well makes up for it by being playful, cute and visually enhancing. Rate the Look - EXO's "Overdose"
Rate The Look - A Pink's "Mr Chu"